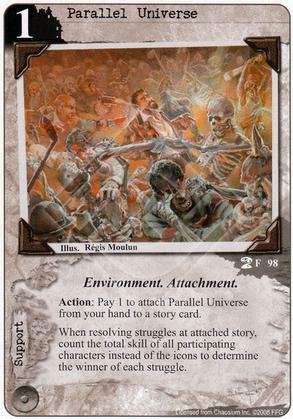 Action: Pay 1 to attach Parallel Universe from your hand to a story card. When resolving struggles at attached story, count the total skill of all participating characters instead of the icons to determine the winner of each struggle. 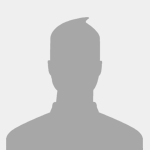 It's Mr. David Pan in attachment form! Not quite as versatile as a character who sticks around to win more than one story, but I think Parallel Universe can be pretty appealing to a high-skill stable of characters, in addition to the Syndicate's own skill-reduction tricks. Add in Marine Salvager to pull Parallel Universe back, and make it a crisis on multiple earths. Syndicate, I guess? It's not like they really need it with characters with David Pan around, who basically puts every story in a Parallel Universe. I don't see other factions get enough Skill on the table on a reliable basis, and with Miskatonic (2nd most skill, I guess) you're probably better off with some alternative struggle manipulations. It's mostly used in Syndicate skill manipulation based decks, where you use this in addition to Mr. David Pan because one Unique guy can't be everywhere. Can this be played after your opponent (or you) commit and before struggle resolution? Yes! And that's why I consider this better than David Pan's ability: You can play it as a surprise action whenever your opponent has a weak moment. It still works best with Syndicate decks, but there's a place for it in every deck that features a few high-skill characters. Amazing card for Syndicate decks. Being able to bring it back from the discard pile with some in faction options can make it exceptionally good.